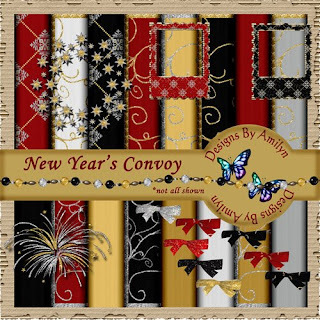 Designs By Amilyn: NEW YEARS CONVOY IS HERE!!! Thank you so much for your wonderful contribution to this Convoy! Happy New Year to you and yours! Thank you! Not only perfect for New Year's but for my wedding which was 14 years ago on New Year's eve! Gorgeous! I love all that sparkle! Thank you... and thank you for the rest of your Christmas kit too! LOVELY! Thanks for sharing, Happy Happy New Year! Thanks so much for your part of this beautiful convoy! Thank you! Cool stars and firework elements!! Thanks!!! Super kit, love it and thanks for sharing. have a wonderful 2009. Thank you for your gorgeous part to this great event!! I knew it was coming but I had forgotten all about this blog train! I came for a visit to your blog today (thank goodness, I did) just to check how you were doing. Wishing you a New Year full of many blessings! Hi! Dropping in to leave a little love and to say thanks! Thanks bunches! Happy safe, healthy, and prosperous New Year! Thanks for you wonderful minikit for the New Years Convoy. I hope 2009 brings you lots of joy. Love this kit!! Thanks so much for sharing it with us. Thank you for making both silver and gold papers and elements. I especially like the fireworks element.